“What is a photograph?,” one of the International Center of Photography’s latest exhibitions, brings together photographic works by 21 artists that in one way or another challenge the definition of the medium. The show, which opened Thursday and was organized by ICP curator Carol Squiers, features plenty of work by established names like Gerhard Richter, Lucas Samaras, Floris Neussus, and Sigmar Polke — some of whom have been experimenting with photography as far back as the 1970s and ’80s. But a newer generation is also represented, one that has pushed photography in entirely new directions. “I was interested in people who were taking ideas form conceptual art and bringing them into energetic interaction with photography,” said Squiers. And for the most part, it’s the younger artists who seem to be creating the most progressive work. Unlike their more established counterparts here, they don’t necessarily have backgrounds in photography or see their work fitting squarely into the photographic tradition — or even, in some cases, that of fine art. Here are four emerging artists who exemplify the diversity of backgrounds, practices, and motivations behind what is being called “photography” today. Inspired by painters like Lee Krasner and Henri Matisse, but using digital tools associated with photography, New York-based Travess Smalley, 27, explores the boundary between the two mediums. He made the works in the show, from his series “Capture Physical Presence” (2013), by creating “digital paintings” in Photoshop, printing them, cutting them up, creating collages, and then scanning the collages and further manipulating them digitally. Smalley’s inclusion in the show seems apt for other reasons, including artistic influences. The manipulated Polaroids taken in the 1970s by artist Lucas Samaras were one of the first experiences of art he ever had. “The essential reason why this question ‘What is a photograph?’ interests me is the very direct relationship of [my ‘Image Objects’ series] to the realm of documentation,” said Artie Vierkant, a 27-Year old New York artist. The works in the series, of which there are a couple of examples from 2013 in the show at the ICP, take on both a digital life and a physical one. 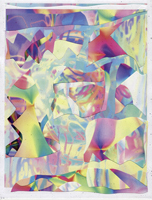 Each begins as a digital file of abstract color forms that he builds in Photoshop, which is then transferred onto Dibond, a type of aluminum panel, which is in turn cut into geometric shapes, resulting in a work that ends up flat, like a photograph, but has a suggestion of sculptural dimensionality. Each time the work is documented, it takes on a new life in the form of the documentation photos, which can be altered by viewers of his Tumblr feed and so give rise new derivative works based on the original. Kate Steciw’s large, abstract, painterly digital collages — which themselves are cut into odd shapes and showcased in unconventionally shaped frames, with small stickers on them and around them — look like they belong to the same digitally manipulated family as Smalley’s or Vierkant’s works. But the motivations behind them are very different. All of the images used by the Pennsylvania-born, New York-based Steciw, 35, who worked for a long time as a commercial photo retoucher and has a master’s in photography from the School of the Art Institute of Chicago, are licensed stock images. “In that way I connect with the history of photography and its highly collaborative nature,” she said, adding that she feels a closer kinship to the appropriationist practice of Richard Prince than she does to artists who are interested in the creative potential inherent in dissemination — like, perhaps, Vierkant. A bright and splashy ribbon of paper hanging from the ceiling and, in places, nearly touching the floor at the entrance of the exhibition, Mariah Robertson’s “154 [detail]” (2010) is a unique color print on metallic paper. Though Robertson mainly works in photography, her final pieces are generally installations like this one, moving the photograph well outside of the pictorial frame. Robertson, 38 and based in Greenpoint, Brooklyn, takes cues from the experimentation and “alternative historical processes” of precursors like the Victorian chemical hobbyists. She makes photograms and seeks out photographic accidents like solarizations and irregular chemical reactions to create work that feels both spontaneous and highly controlled, mostly abstract but sometimes with figurative elements. Robertson’s one-of-a-kind works are created the old-fashioned way, by hand-processing color photographs in a dark room with a variety of methods. For one image she might use filters, enlarge negatives, and create handmade patterns by placing objects directly on the paper. She develops the photos with chemicals she sprays onto the surface of photographic paper, controlling their reactions by manipulating temperatures. And because she uses discontinued materials, some of her series may soon come to an end — meaning that her work engages traditional photographic practices and processes while navigating their imminent obsolescence.